Brown, M. (1999). Verdun 1916. Stroud: Tempus. ISBN 0-7524-1774-6. Holstein, C. (2009). 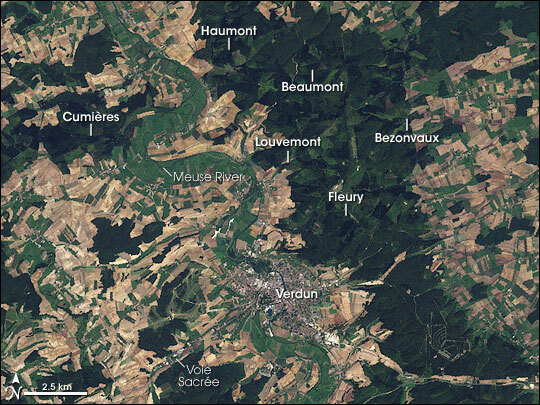 Walking Verdun. Barnsley: Pen and Sword. ISBN 978-1-84415-867-6. Keegan, J. (1998). The First World War. London: Hutchinson. ISBN 0-09180-178-8. MacKenzie, D. A. (1920). The Story of the Great War. Glasgow: Blackie & Son. OCLC 179279677. McDannald, A. H. (1920). The Encyclopedia Americana. 38. New York: J. B. Lyon. OCLC 506108219. Martin, W. (2001). 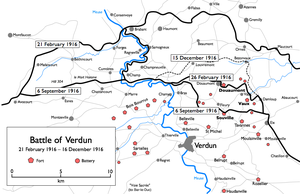 Verdun 1916. London: Osprey. ISBN 1-85532-993-X. Mosier, J. (2001). The Myth of the Great War. London: Profile Books. ISBN 1-86197-276-8. Sonnenberger, M. (2013). Initiative Within the Philosophy of Auftragstaktik: Determining Factors of the Understanding of Initiative in the German Army 1806–1955 (MMAS). Fort Leavenworth, KS: US Army Command and General Staff College. OCLC 875682161. สืบค้นเมื่อ 12 June 2014. Chlumberg, H. "The Miracle at Verdun"
หน้านี้แก้ไขล่าสุดเมื่อวันที่ 8 พฤศจิกายน 2561 เวลา 21:56 น.